Planning for retirement should be an ongoing process until the day you are officially retired. The economy the past couple of years have changed how some of us view retirement incuding yours truly. According to the Wall Street Journal phased retirements plans are becoming more common. A phased retirement is an alternative to regular employment that abruptly ends with a full-time life of leisure. It’s a slower transition to full retirement that can be handled a variety of ways. The time period can be defined or open-ended depending on the company. 1. More Paid Time Off. One couple in the article are still full time their last few years of work but took a pay cut for 5 more weeks of vacation each year. This option would meet the needs of people that retire to do more traveling. 2. Part time/job sharing. Shifting to fewer hours is another option. The company benefits by not losing all the knowledge in one fell swoop and has an opportunity to transition the job from one person to another. 3. Per Diem/Contract. Work on an as-needed or project by project basis for your previous employer. This benefits the company because you already know the people and processes. In addition to the reward of easing out of a full time life, there are financial benefits to this type of retirement plan. 1. Social Security. The longer you can hold off on collecting Social Security benefits the bigger the check up until age 70. 2. Benefits. Depending on which type of phased retirement the employee can continue to earn paid vacation and other benefits including medical insurance. 3. Continued savings. Easing into retirement gives retirees more time to build up retirement accounts that may have been greatly reduced due to negative stock market performance during the recession. Phased retirement sounds like a great option to me. When I’m close to that stage it will be something I’ll discuss with my employer. Does a phased retirement appeal to you? Not for me. I have a job that has me checking in even during weeks off. Although, my time is flexible when on the clock, when I’m working, so it evens out. What I’d look forward to is a second career. When we can afford to retire, I plan to do some other income producing things. Both to keep my brain going and to do what I’d love. Joe, I would never have thought I wanted to work post-retirement, but now that’s in the next decade it’s a possibility. Shaun, I agree that this type of approach is gaining popularity. Thanks for stopping by and commenting. .-= Eileen WilliamsÂ´s last blog ..Women Over 50: Popeye Meets the Beatles! =-. I’m humbled to have a published author stop by. Your book is very useful for us boomers. I think many of us haven’t done job hunting in a while and its changed a bit. Phased retirement wasn’t my idea but a topic I thought deserved more discussion and thought. Oh man, I really wish I could consider early retirement. I’ve got a long way to go. Thanks for stopping over to my place. Hi Lynn, I guess my retirement plans are technically early because it’s before full social security benefits kick in, but it doesn’t feel early. Thank you for commenting and I hope to see you again. I’m a long ways from retirement, but I like the idea of a phased retirement plan. The idea of job sharing is very appealing. More days off, but still keeping the benefits and partial salary sounds like a good choice. I love that postcard of the beach, but how many retired people actually move to an area such as this? I’d be interested to find out! .-= Little HouseÂ´s last blog ..Wonderful Passive Income =-. Little House, good question about the picture. I’ll put that down as a future article idea. We want to retire near water, but can’t afford that type of view. I’m not so far away from retirement (within a decade) so it’s on my mind about how to make it work for us. Sounds like a WONDERFUL option to me too! Just hope that when you start phasing in, you can decide not to retire if you think it’s not for you. It may be too late though, in ur employers mind. But, since ur still working, maybe not if u change ur mind! Good point and changing your mind to leave would probably be a problem for some employers who have made alternate plans. The WSJ article mentioned that some companies would only offer this for a year and at others it would be open-ended with the option to return to full time. 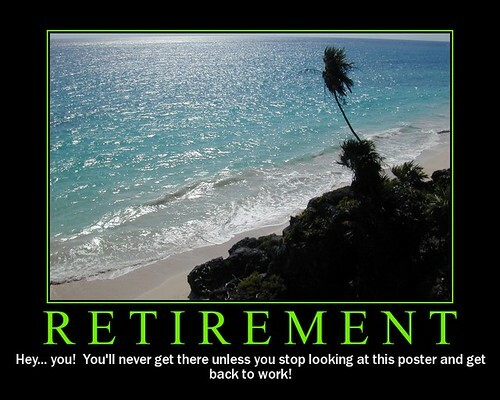 I would definitely take a phased retirement. It not only helps in the wallet but also with good health. The healthier retirees are the ones who keep moving, working, doing something…Good post. .-= KenÂ´s last blog ..Weekend Edition =-. The benefit to health is a good point. I read that retirees without something to keep them occupied do suffer in life expectancy. Thank you for bringing that into the conversation. I loved this because I’m really wrestling right now with leaving full-time work to write and “have a life,” yet not wanting to forgo benefits, reliable income, etc. Please keep writing about this — I think there are many boomers in the same boat, in our late 50s, early 60s. I would love to hear from others who have made the transition. Elizabeth, I would love to hear from them too! It’s a great idea and I plan to do some kind of phased retirement; just not sure what!